Although reproductive medicine is a modern development, the theories behind this specialty originated as far back as Aristotle. A human egg provides the basis for human life. Microscopes allowed biologists to view embryos, and the structure of DNA added details to the developing picture of embryology after 1950. Now, DFW Center for Fertility & IVF provides patients in the Allen, TX, area with advanced, effective assisted reproduction solutions for their battle against infertility, including the latest in embryology. The key to many assisted reproductive treatments is the safe, prompt transfer of the eggs, both before and after they are inseminated. Fertility drugs are administered to prep the mother’s body, producing a healthy environment for eggs and preventing ovulation before retrieval in our Allen fertility clinic. 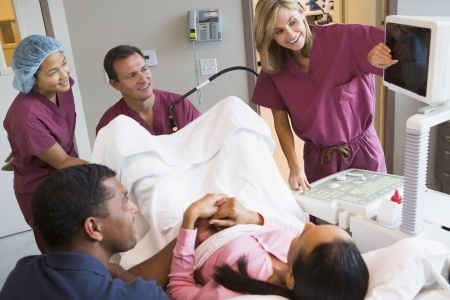 A baseline pelvic ultrasound is done to ensure that ovaries are free of cysts. A blood test can confirm whether the ovaries are properly suppressed before the process of menstruation and ovarian stimulation begins. Your fertility doctor will prescribe hormonal drugs to stimulate final maturation of the oocytes, and then determine the right day to retrieve the eggs. With the patient under mild sedatives, the mother’s eggs are removed from the ovary with a needle, guided by ultrasound. Your fertility specialist withdraws the eggs, along with nearby follicular fluid and granulosa (egg-supporting cells) with the help of a tiny suction pump and ultrasound probe. The eggs harvested vary from patient to patient, but the average is between 8-15 oocytes each. After retrieval, your eggs are kept in dishes or test tubes held in incubators at just the right temperature and atmospheric conditions. In a few hours, sperm are placed in the cultures with the eggs. In some cases, sperm may be injected into the eggs using intracytoplasmic sperm injection (ICSI). The embryology technician uses micromanipulation equipment (robotics) to inject the eggs, then the inseminated eggs are put back in the lab incubator to continue the IVF embryo transfer process. Our fertility specialists at DFW Center for Fertility and IVF assess embryo development until they reach the blastocyte stage with 80 or more cells. 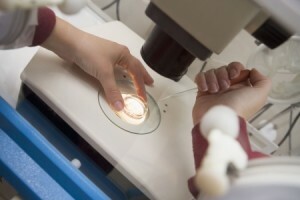 If the fertility specialists recommend it, the embryology lab may apply assisted hatching techniques to help along development. When embryonic fertilization is successful, embryos can be transferred to a viable uterus within just 3-6 days after egg retrieval. An embryo must grow to about 100 cells before implantation can occur. To assist the hatching process, a hole is made in the sac that surrounds the developing embryos using either a chemical, needle or laser. Before transferring the fertilized egg to the uterus, your fertility specialist may recommend genetic diagnosis and genetic screening. Certain procedures help patients with serious inherited disorders to lower the risk of having a child affected by the same problem. These techniques remove a cell from an embryo and send to the lab for diagnostic tests. Acceptable embryos can then be transferred into the patient. PGD and PGS may also increase the pregnancy rates of some women with chromosomal disorders that result in either lower implantation rates of embryos or higher miscarriage rates. After a few days of development, the best embryos are selected for transfer. The number of eggs chosen influences the pregnancy rate and multiple pregnancy rate. In addition, the woman’s age and the appearance of the developing embryo have the greatest influences on pregnancy outcome. Embryos are placed in the uterine cavity with a thin tube. Any extra embryos of good quality can be frozen. The embryo transfer procedure is usually performed three to five days after oocyte retrieval. The physician will pass a catheter through the cervix into the uterus and deposit the embryos into the uterine cavity along with a small amount of fluid. This procedure does not require anesthesia, and the patient usually leaves the office after a brief recovery period. The Society for Assisted Reproductive Therapy has set guidelines for the number of embryos to transfer and remaining embryos can be frozen for a future embryo transfer cycle. Embryo freezing is an important part of IVF process. Good quality embryos can be frozen, providing a second or even third opportunity for pregnancy without undergoing another ovarian stimulation and egg retrieval. Embryos that meet developmental criteria for appearance and rate of growth can be frozen at several different stages. There are two basic freezing methods: slow cooling and vitrification. Slow cooling calls for the embryos to be placed into special freezing solutions. The temperature of the embryos is slowly decreased and finally stored in liquid nitrogen or liquid nitrogen vapor. Vitrification is an ultra-rapid freezing method where embryos are placed into special solutions and then placed immediately into liquid nitrogen. Embryos are stored as for slow cooling. The freezing method determines how the embryos must be warmed or thawed. Not all embryos survive the freezing/thawing procedure and sometimes an embryo cannot be found after freezing. Embryos can be transferred into patients whose cycle has been synchronized with that of the stage of the frozen embryo. Alternatively, embryos can be transferred during a “natural” cycle. 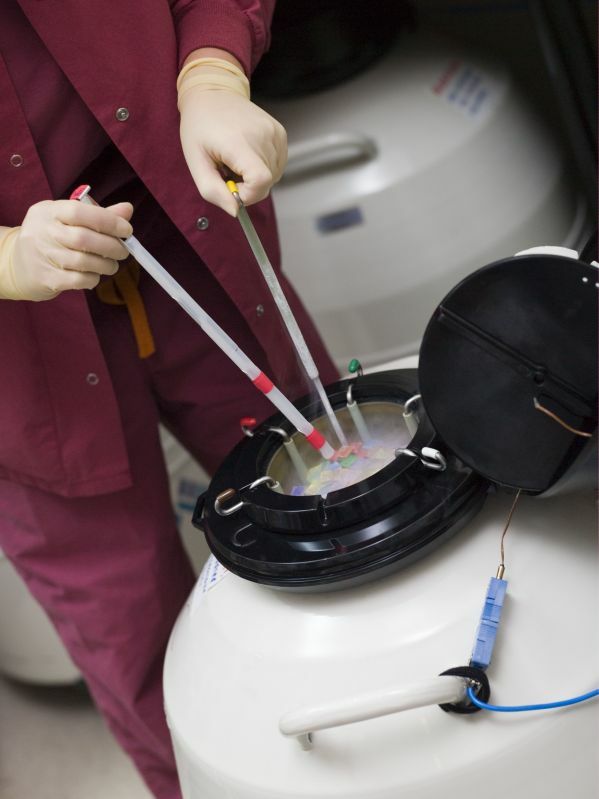 Embryos can be stored indefinitely in a reliable, quality-conscious assisted reproduction facility. For comprehensive embryology services as part of our advanced infertility treatment program in Allen, TX, contact DFW Center for Fertility & IVF online or call 469-854-0305.